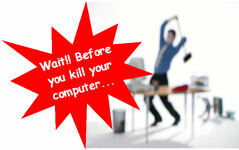 Can your business afford "downtime?" Don't take chances with a slow network, or a system that crashes often. It might be warning signs of a impending disaster. Before you smash your computer system give us a call --quick! Amber Computer Solutions is a 23 year old IT support and consulting company based North of the river (Kansas City MO). We specialize in both small business and at-home IT solutions. Our technicians are experienced professionals that are skilled in all aspects of desktop support and networking. For Information or comment regarding this site click here to send email .